Plenty of puddles greeted Parkrunners at Frimley Lodge this week but that didn’t deter 478 from toeing the line and of those seventeen were Sandhurst Joggers. We had a mix of milestones, PBs and sociable runs with Janet Venables celebrating her 150th Parkrun and Max Woods his 100th. Clive Rolfe was first SJ to finish in 19:47 with Dave Ayling and Max not far behind. Caroline Stuart came close to her best at the venue, Jane Bannister’s 28:42 is her fastest at Frimley and Larry Sharp ran a seasons best 30:13. Chapeau to Gareth Hopkins and Sophie Pibworth who both recorded PBs with 30:31 and 34:45 respectively. Four members hit Parkrun Bracknell with Patrick Wadsworth first to finish for the club in 23:47. Lucy Ong warmed up for the Basingstoke Half Marathon with her very first Parkrun finishing in a great time of 32:18 and Joanna Bland knocked over two minutes off her previous best to record a new PB in 41:12! Another SJ quartet headed over to Rushmoor with Andrew Brooks making his return from ‘semi-retirement’ to finish first SJ in 19:06. Alurie Dutton ran her fastest time at Rushmoor since May 2016 with 34:22 and Gavin Loader sampled the venue for the first time as he continued to support others at Parkrun. A plethora of Parkrun Tourism this week. Starting close to home… Hannah Glaister hopped up the A329 to Reading for her second appearance at the venue. Stuart Overhill prepped for XC at Homewood, Lisa Hale tried the ‘steeply undulating’ course at relatively new venue of Henley-on-Thames and John Tovell stayed at home at Crane Park. Further afield; Yvette Glacken ran at Luton Wardown, Will Lucas on the beach at Seaton and Kevin Forster at Prudhoe Riverside which is held at the Tyne Riverside Country Park in the North East. Special mention for Mark Pattrick who made the short trip to Parkrun’s spiritual home; Bushy Park. Mark logged his fastest time since 2015 as he joined 1228 other runners to celebrate the 700th Parkrun to be held at the venue just a week ahead of the 13th anniversary of Parkrun’s inception back in October 2004. Saturday 7th October will be a special day for Parkrun as International Parkrun Day will celebrate #parkrun13 so hopefully lots of members will be out there celebrating as well. 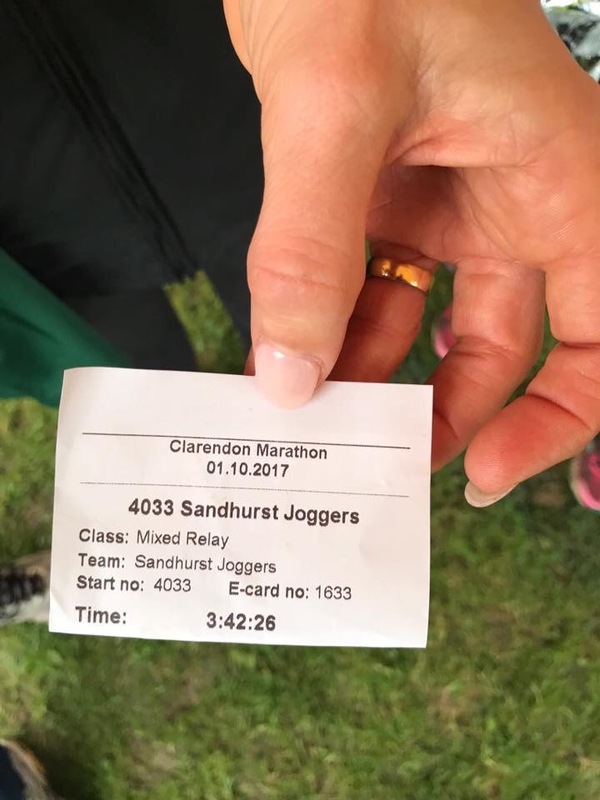 Four members took on the Clarendon Marathon solo on a challenging course from Salisbury to Winchester. Jon Gubb made a very last minute decision to race and finished in an impressive 4:00:54. Max Woods was come in 4:27:17, Patrick Wadsworth less than a minute later in 4:28:15, Leon Hicks continued his phenomenal ‘streak’ of marathons finishing pain-free in 6:12:41. Meanwhile a four person SJ Relay team of Alan Kirby, Alison Jones, Fiona Slevin-Brown and Graham Meek was storming around the course en route to finishing in 3:42:26. 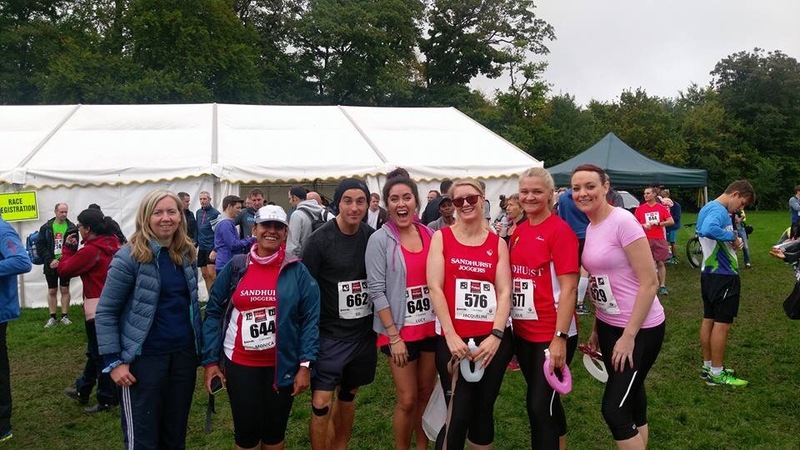 Six members took on the Basingstoke Half Marathon with special mention to half marathon first timers Lucy Ong, Jacq Hudson, Holly Dunn (who is missing from the results below but finished in 2:43:09) and Julie Graham who only graduated from the Pure Beginners course last year! 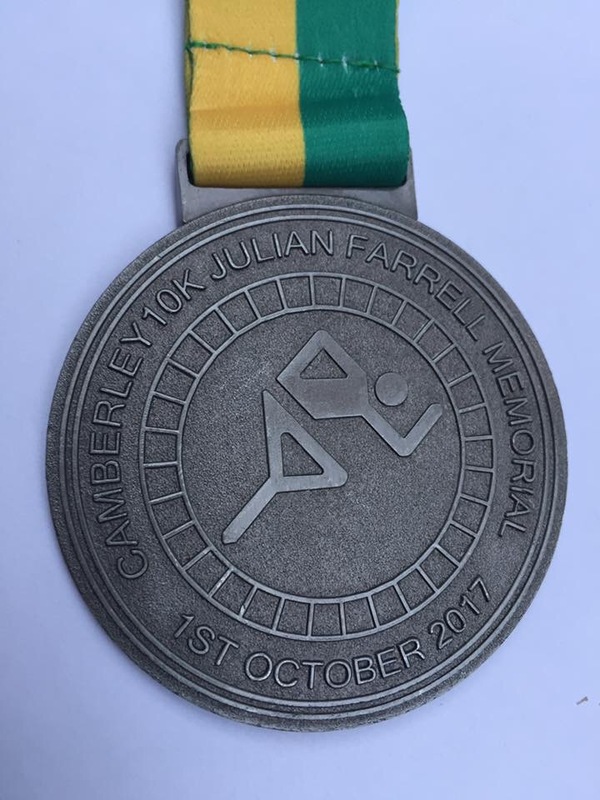 Jackie Kent had an eventful run, stopping for 20 minutes to help a collapsed runner who thankfully was ok.
Lots of members in action at the Julian Farrell Camberley 10k, although Jim Laidlaw was missed off the results below as he was wearing the wrong coloured vest, he finished in 41:52. 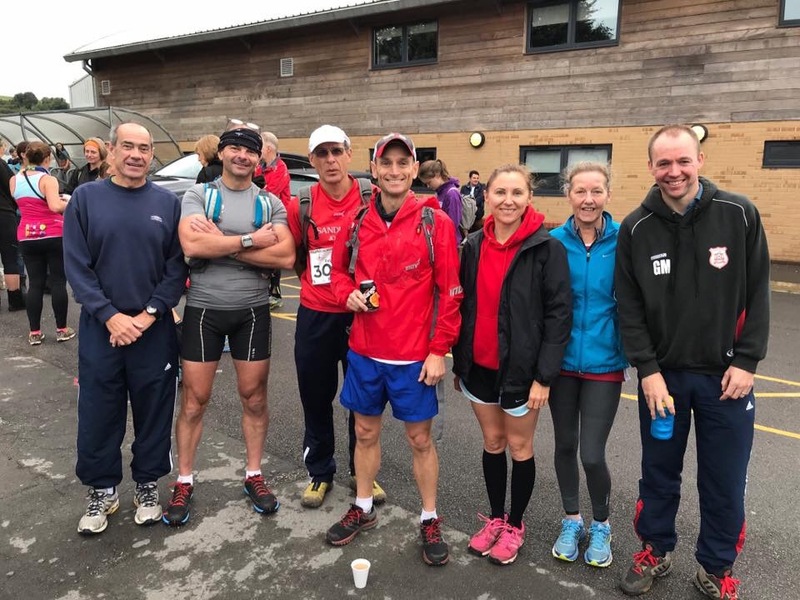 Taking in many of Reading’s waterways; the Blueiron Reading O2O 10k was also held on Sunday and our very own Stuart Holbrook finished in a great time of 49:33. 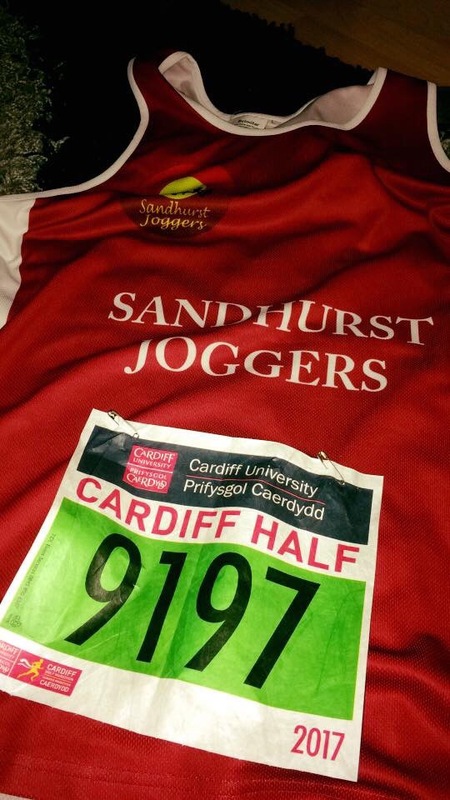 More race action but a little further from home at the Cardiff Half Marathon saw Patrick Denston finish in 2:04:10 and James ward 1:32:53. Thursday: This week the threshold/improvers run will be on the ‘Ellis Road’ route as we’ve already completed a rotation of all the winter run routes. Meet at Sandhurst Sports Centre at 7:30pm. The course is at Hillingdon House Farm Fields (Postcode UB8 1ES), take Swakleys Junction off the A40, turning right along the B483 Park Road. It is approx. a 45min journey by car. Some people meet in the public car-park behind Sandhurst Library at 9:00ish am to car-share and/or drive in convoy to the venue, leaving no later than 9:15. The course will be slightly different from last year, it will still be three laps, but part of the first lap will be run in reverse. As well as tea and cake in the Athletics Stadium after the race many members will head for a drink at the Cricket Club opposite the Athletics Stadium. .